The Austrian Sculpture Park in the Styrian town of Unterpremstätten, seven kilometres south of Graz, is a very special open air museum. 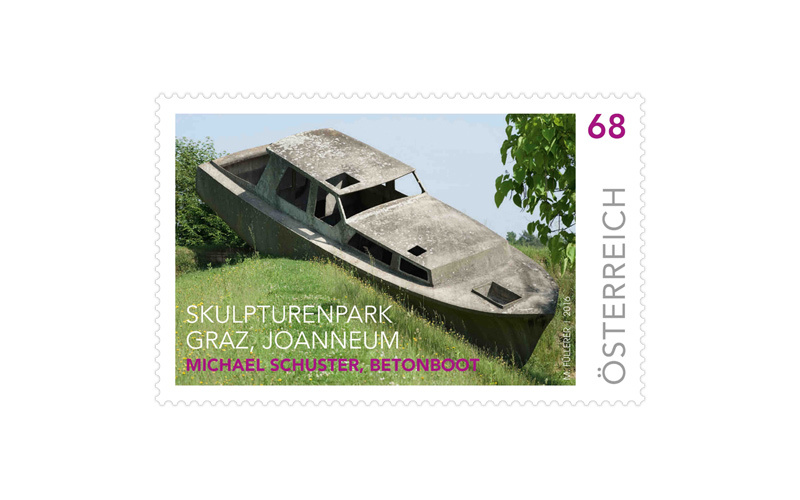 Austrian Post is now featuring one of the works exhibited there, the concrete boat, on a commemorative stamp. The idea of creating the Sculpture Park came from former ORF regional director Emil Breisach, who started exhibiting sculptural works by Austrian artists on the ORF site in Graz in 1981. The aim was to make contemporary sculptures accessible to the public outside the confines of a museum. In the year 2000 the International Garden Show, designed by Swiss landscape artist Dieter Kienast, was held in Unterpremstätten, and the venue proved to be perfect for use as a sculpture park. The Austrian Sculpture Park private foundation was set up, and the concept of an international sculpture park, designed by Christa Steinle and developed by Peter Weibel, was presented to the public in 2003. In 2007 the running of the sculpture park was handed over to the Landesmuseum Joanneum. The collection of works by Austrian and international artists has since been continuously extended, accompanied by an academic discourse. Nowadays the park contains more than 70 sculptures over an area of around seven hectares, including works by Austrians Fritz Wotruba, Franz West, Erwin Wurm, Heimo Zobernig and Michael Kienzer, among others, and by international artists such as Nancy Rubins or Yoko Ono. 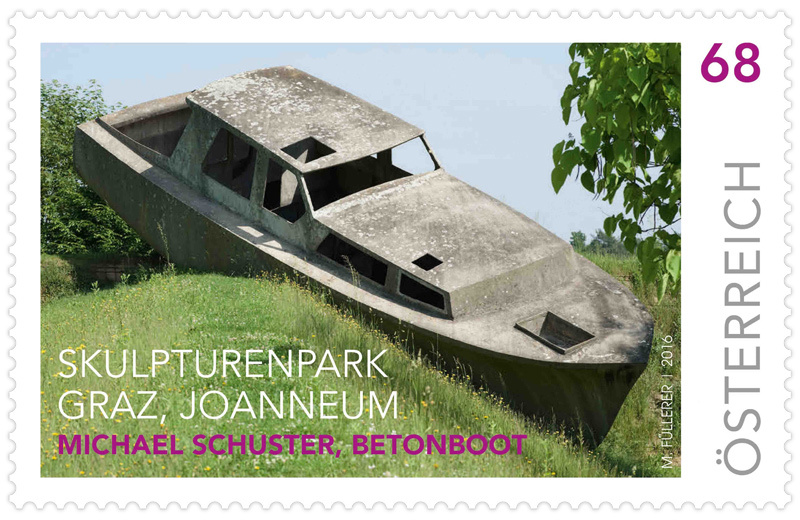 The “Betonboot” (concrete boat) by Graz artist Michael Schuster reflects its surroundings in object-like form. The boat appears to have been catapulted out of the nearby bathing lake and to have landed in the waves formed by the artificial hills of the surrounding area, which it thereby transforms into a part of the work of art itself. The sculptural representation of a real object – the boat – in cast concrete alludes to the function of the park as a show-place for sculptures. At the same time, the “stranded” work of art can also be seen as an ironic allusion to the sculpture park theme. Since the 1970s Michael Schuster, who was born in 1956 in Graz, has been dealing with the issue of the perception or reproduction of reality in his media-reflective works, such as photo installations, light objects and media sculptures. In his photographic works he uses photography as a mirror and asks the fundamental question of whether the mirror tells the truth. Photography delivers an illusion of reality. The “Betonboot” is a reflection on location-specific factors and deals not only with the object itself, but also with how it is perceived and its position within its artificially created surroundings.